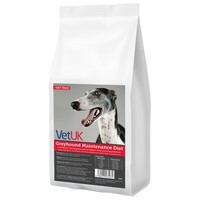 VetUK Greyhound Maintenance Diet Dog Food is a maintenance food designed to meet the specific needs of retired and resting greyhounds. Made with high quality ingredients, the delicious VetUK Greyhound food has been carefully balanced with the right levels of protein and energy to ensure they maintain a healthy body weight when a resting diet is required. Containing chicory fibre to enhance digestion and optimal gut health, the highly digestible food can also be supplemented safely with meat or fish without worry of overfeeding. The food also contains high levels of Omega 3 and 6. If your dog does not like VetUK food, just return it and we will refund the cost of the bag with no quibble. At last, Beano my Greyhound has nice solid poo!! He loves this food and looks in great condition. Can`t fault it. We normally feed Burgess Greyhound and Lurcher but bought a bag of this to try seeing as its cheaper and a bigger bag. Usually if we change food we are faced with upset tummies and rather runny outcomes but to my surprise our two greys had no problem on this, even going straight to it and not weaning them from old food (we ran out so was our only option!). Two things I would note is that these are large kidney bean shaped biscuits (in comparison to the tiny round biscuits in Burgess), but we soak the food due to bad teeth so it doesn't make too much difference and the second thing is farts! The dogs seem to fart more on these biscuits and I apologise now for this..... they smell so odd! - Overall, despite the farts, its a good food. This is the best greyhound feed we have ever used. Perfect well formed poos and dog loves it. put my 7yr old saluki/greyhound on this as I thought she was too ribby looking and thin. She works hard keeping my springer spaniels fit. since being on this for 1month she has got very good condition without putting on weight. would recommend. My fussy greyhound loves this food. After a long struggle I have final found something that she wants to eat. I fed my pet lurchers this on its own, but they prefer it mixed 75:50 with Burgess greyhound/lurcher food. Cheaper than the other brand, that's why I changed, so am glad they like it as a mixed ratio.